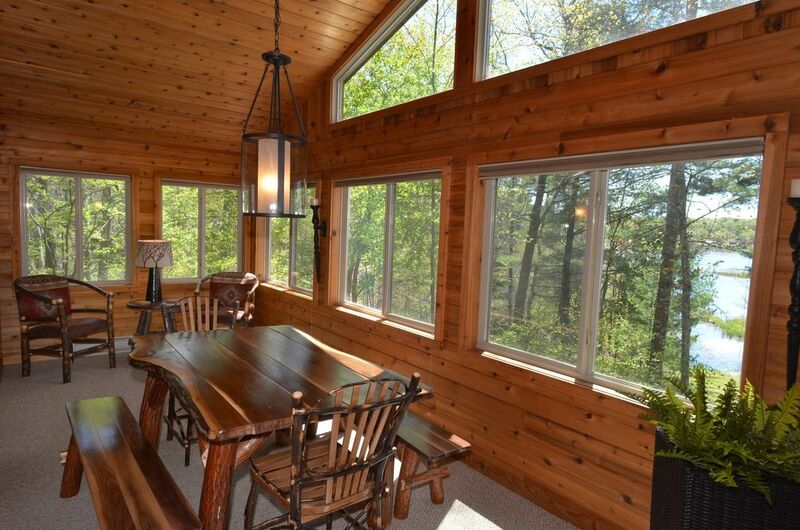 Built as a winter or summer escape for a couple or small family, this beautiful four season cabin is a great way to experience the Northwoods of Wisconsin. The home is very private, and has great access to the lake, the woods, and the Hayward area. The cottage sits on 3.5 acres with 350 feet of frontage on Upper Twin Lake making for a very private experience. The surroundings and views are very natural. The house itself is of the classic Northwoods archetype: 2 bedrooms, 1 bath, wood fireplace, and ample kitchen, living, porch, and deck space. The kitchen has the basics for a cabin, the bedrooms are cozy and have good beds, and the fireplace will keep you warm at night. All of the furniture is new as of Spring 2016. The interior was also updated in spring 2016. We've made the outside space as enjoyable as possible with a fire pit for roasting marshmallows, a picnic area, and a dock for your boat. The dock is in a shallow bay, however there is a channel connecting to the main lake, so pontoon, fishing, and ski boats of all sizes can safely park at the dock. The home is located on the northeastern tip of Upper Twin Lake. Twin Lake is noted for it's great musky and bass fishing, and clear waters. It is also big and deep enough for water skiing and tubing. Upper Twin connects to Lower Twin and the Tiger Cat Flowage as well, so there is a lot of water to explore. If you are looking to relax in private with your loved ones this is a place that exudes family time. Whether it is canoeing on the lake, boating out the lake to the Blackiron Bar for a burger, catching some fresh fish for dinner, biking on the forest roads, or reading on the porch, you will be able to relax undisturbed in this unique Northwoods retreat. Winter is a very special time here...a true winter wonderland. The snow is a pristine white...the solitude at a level that forces you to unwind. Whether it is a snow shoe down the shore of the lake, ice fishing, a cross country ski session at the nearby birkie or Mukwanago trail, or a weekend of snowmobiling...winter is a great get away time. Try the winter...you will be glad you did!!! With the famous resort town of Hayward just 12 miles away you can choose from a variety of world class attractions, restaurants and shops. I grew up in Hayward and love everything about the area and Northwoods experience. I fish the lakes and rivers for muskies, ski the Birkie, and have even won a few titles at the Lumberjack World Championships held in Hayward every July. My wife and I bought this cabin in 2015 knowing that it would be a great place to get away on weekends and holidays. We also knew that it would be a great vacation rental as it is on a great lake in a great area. I work in the real estate industry as a developer/salesperson/investor, and have been renting other homes on VRBO for 6 years now, so I know what it takes to give guests the experience they are looking for. We would love to share the cabin with you! Feel free to call or email me with any questions. It is a classic cabin on a classic lake, but with an updated aesthetic. You can do it all here: boat, fish, bike, ski, or just relax. The location is great, 11 miles east on 77 from Hayward, so you are close enough to town to have fun there, but far enough away to have some peace and quiet. Twin Lake is a great lake - clear, lots of fish, but not too many people with big boats pushing up wakes. It is the perfect mix of wilderness and fun. For winter time fun, the Birkie and Mukwanago ski trails are nearby as are several snowmobile trails. The home is on a 5 acre lot, so it is very private. Other houses are a significant distance away. It is also newly remodeled and furnished as of spring 2016. Right on Upper Twin Lake. Dock for boat. Lake is great for fishing and swimming, however shoreline in front of home is not suitable for swimming. Large expansive views of lake. 350 feet of frontage on twin lake. Dock for boats of all sizes. Frontage is not suitable for swimming, but you can easily anchor out in the lake for a good swim. towels for each guest, no changes, not to be taken to beach. You can use anything you find in the house, but the owner doesn't provide anything. All pantry items are left from prior guests. If you want something you are best off providing it on your own. For DVD, HDMI hookup, and streaming only...no cable or satelite connection. Excellent Cross Country skiing nearby on Birkie and Mukwanago trails. Lots of good courses nearby. What a wonderful place to enjoy nature, read a book by the fire, and enjoy a home cooked meal in the beautiful wood finished sunroom. We enjoyed our stay at this cabin. It was clean and well equipped with all the basic necessities. It was a very private location and the deer visited frequently! The only drawback was the ice and snow on the sidewalks and deck which made it very difficult to manage our dogs and sometimes ourselves outdoors. We stayed here for the Fat Bike Birky. Perfect for us. Very nice, clean rustic on the lake. Walking distance to local bar. Most likely will book here again. This was a great getaway. The fireplace was perfect and the views were amazing. We are definitely planning another visit in the future! Great cabin. Nice views of lake. Don't have a bad thing to say. Great location on lake that actually has fish in it. Extremely quiet and peaceful. Fireplace keeps house toasty and warm. Clean, and everything worked as advertised. Highly recommend! Please read rental agreement for all rental terms and conditions, and pet rules/pet fees.